Dental implants involve surgically positioning metal posts or frames into the jawbone (mandible) to allow our dentist to mount your replacement teeth on top. Because these implants are fused to your bone, they provide stable support for artificial teeth. This is often the preferable restoration option in comparison to dentures and bridges where you are required to ground down adjacent teeth to hold the new replacement tooth/teeth. However, like most restorative procedures, you would be required to have a thorough consultation with our dentist. The consultation will determine if dental implants are suitable for your unique situation, considering gum health, bone structure, bone size and oral hygiene. If you are in good oral and general health, this treatment may be an open option for you. Our dentist will assess your gum health, teeth structures and general health (smoking or other health concerns such as diabetes and heart disease) to see if you are suitable for the procedure. This is conducted through a cohesive consultation that will involve taking previous dental treatments and health concerns into consideration. Additional treatments prior to the dental implant will be conducted if required. These can include tooth extraction of damaged teeth, removing or filling damaged crowns or root canals, or improving your general oral hygiene practices. 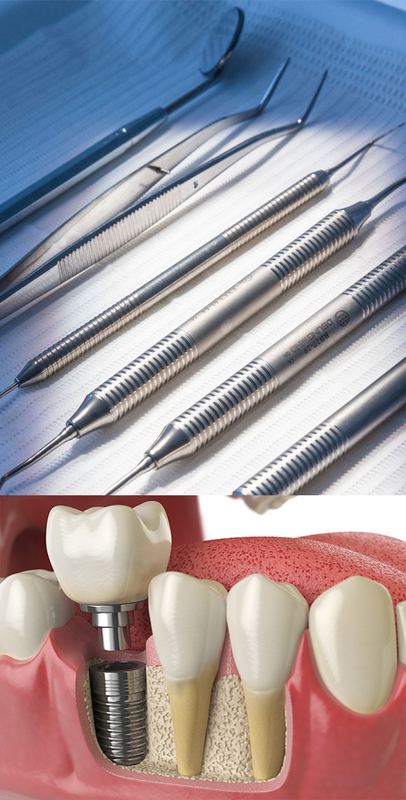 Once all procedures and concerns are addressed, our dentist will proceed with the dental implant. Our dentist will surgically place the implant into the jawbone. This is performed by making a small incision (cut) in the gum, followed by embedding the implant into the mandible using a screw. A local anaesthetic will be administered to ensure pain during the dental implant surgery is pain free. Following the placement of the titanium screw, our dentist will stitch up the incision. Recovery Process -in the initial 48 hours post-surgery, the swelling and minimal bleeding (from the incision) will begin to subside. You may also experience mild discomfort and pain up to a week after the surgery. This is normal and can be addressed through pain relievers that our dentist will prescribe. After the dental implant surgery, the bone and surrounding tissue will need between three to six months to completely heal (osseointegration process). During this time, new bone will form around the implant, anchoring the screw to ensure its sturdiness. You may also be required to wear a temporary crown to prevent bacterial infections from developing. A diet of soft foods and warm soup is recommended to promote recovery. Following osseointegration, a second operation will be required to uncover the top of the implant, attach the abutment and permanent crown. For single tooth implant, our dentist will customise a dental crown specific in size, shape, colour and fit to achieve the natural look in comparison to your smile. If more than one tooth is replaced, custom-made bridges or dentures will be made. Depending on your oral health, this procedure may require more than two appointments. Maintenance -one of the biggest advantages of dental implants is that they require no special after-care. Implants have the same structure and purpose as regular teeth, therefore, maintaining good oral health through adequate brushing and flossing, and visiting our clinic once every two months is enough to keep the implants healthy and clean. With good oral care, you can expect implants to last a long time. To book your initial consultation, call us on 02 9051 2829.